Two Cherry Hill Youth Cheerleading won medals at the Cheer/Dance Extreme’s Finale event on March 16. 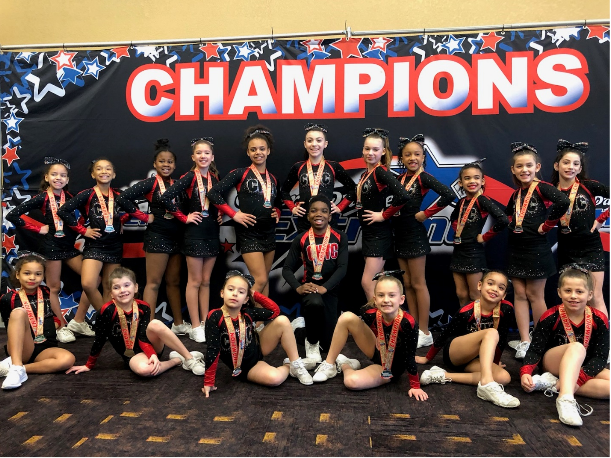 Cherry Hill Youth Cheerleading ended its 2018–2019 season with a bang at Cheer/Dance Extreme’s The Finale event. On March 16, two teams from Cherry Hill Youth Cheerleading traveled to Kalahari Resort and Spa in Poconos, Pa. to participate in their Finale competition. Both teams participated in this two-day event, which included teams from several states. The Youth Level 1 team (Dynamites) took home another round of first place medals and championship jackets. The Senior Level 2 team (Explosions) took home second place medals. Both teams put forth stellar, flawless performances and earned near perfect scores. CHYC is extremely proud of the cheerleaders and thrilled that they were able to represent Cherry Hill in such a positive, powerful way. Cherry Hill Youth Cheerleading is having an open house on March 30 from 9 a.m. to noon to showcase the talents of these spectacular cheerleaders and take registration for the upcoming 2019–2020 season. CHYC is also hosting a Cheer Prep Program for anyone interested in pursuing cheerleading. Registration for this three day camp can be found through the Cherry Hill Recreation catalog and website. Visit chyconline.com to register for the upcoming year and like CHYC on Facebook for more information and events.